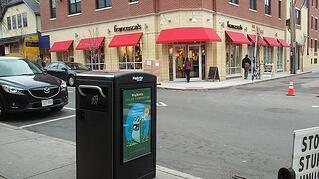 Providence, RI, March 8, 2016 – The Thayer Street ‘Business Improvement District’, better known as the Thayer Street District Management Authority (TSDMA) today announced the deployment of the Bigbelly Smart Waste & Recycling system for more efficient waste management coverage across the District. In support of its continued commitment to leverage innovative technology to enhance the District, Bigbelly’s smart waste and recycling system has replaced all of the traditional trash bins on the streets with smart, connected waste stations while providing a cleaner, greener, and more beautiful landscape for the community and its visitors and residents. The Thayer Street District Management Authority (TSDMA) was established by Thayer Street property owners and granted status to operate as a ‘Business Improvement District’ by the City of Providence Code of Ordinances and in accordance with RI General Law 45-59-14(b) in January 2006. The District is comprised of the area bounded by Bowen Street, Brook Street, Waterman Street and the rear lot line of parcels that face the western side of Thayer Street. Over the years since our establishment, the district has undertaken the installation of new sidewalks, new bicycle racks, public outdoor benches, a bicycle repair station, district wide tree wells improvements and beautification, replacement of unhealthy or missing trees, facilitated group trash compactors and cardboard recycle centers, co-sponsored the fabrication and daily management of the City’s first public Parklet, daily sidewalk cleaning, trash and graffiti removal as well as hosting an annual fall art festival. For more information, visit www.thayerstreetdistrict.com . Bigbelly, Inc. is the world-leading provider of smart waste & recycling management solutions with more than 1,500 customers in 50 countries. Solar powered, the Bigbelly Smart Waste & Recycling System combines cloud computing with smart compacting waste and recycling stations. The system helps customer beautify their public space and reduce operational costs by 70-80 percent. Visit http://bigbelly.com. Follow on Twitter (@BigBellySolar), Facebook and LinkedIn.